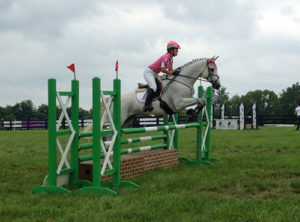 Wellspring Farm offers an unrated Hunter/Jumper Show Series each spring. We also have several schooling Dressage and clear round jumping shows. These shows are open to outside riders as well as riders from Wellspring Farm. All of the pre-show and day of show work is done by volunteers and/or working students. Some of the parents get involved on the day of the show. Before the first show series began, the jumps and to be built and painted. For the students at Wellspring Farm, both children and adults, the shows offer an opportunity to compete with each other and with those from the outside as well. A complete hunter division is offered including beginner and advanced beginner divisions for children and adults that are just starting to ride. In the Dressage show we start with walk-trot tests and go from training level through fourth level Dressage. The jumping starts with a peewee division elementary ground poles to provide classes for our beginner riders, and goes through preliminary (jumps 3′ 7″) for advanced riders. For all shows we attempt to find judges that are constructive and positive in their comments so that the shows are enjoyable as well as educational to the competitors. We try to offer activities for all levels of riders. 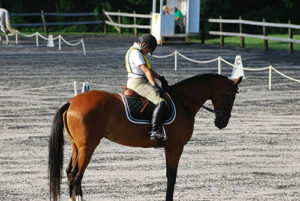 Many people are not interested in competitive riding, or they aren’t accomplished enough to participate in a horse show. For these people, we offer several fun shows each year. They basically consist of games on horseback and much fun is had by all! The public who come to the park always line the fences and thoroughly enjoy the show. We’ve had numerous park visitors (who may have not been horse enthusiasts) as spectators. Many of them mention how much they have enjoyed watching and ask for the dates of upcoming events. a) Draw checks to the order of Wellspring Farm, Inc.
Times will be available on our web site: www.wellspringfarm.us.com on the Thursday before the show date or if you do not have internet access call 302-798-2407. From South, I-95 North to Exit 9 (Marsh Rd. ); left at end of ramp go straight, through light. Bellevue State Park on right. Follow road to stables. From North: I-95 South to Exit 9 (Marsh Rd. ); turn left onto Marsh Rd. At next light turn left onto Carr Rd. Bellevue State Park on right. Turn in and follow road to stables.